Ahh, New Year’s Eve. Unadulterated debauchery. Chaos incarnate. Societally-palatable anarchy for several hours of a cold, winter night. A night where, to some, a single kiss marks the success or failure of an entire year’s work. But, for others, it is a night to avoid the lunacy, stay calm, and enjoy the passage of time in a relaxed and well-behaved manner. Whichever, most consider it a night to celebrate. Many a stoner has failed this test of participation. We are only human, after all. Perhaps you have fallen asleep to early and missed midnight altogether. Or skipped the whole holiday and staying home with a blunt in hand. Or maybe you were just too burnt to even recognize the milestone of another year fading into the annals of human history (we’ll save the debate of whether it matters at all for a later date). This year, we want to help you avoid this fate. In fact, this year, we want to give you the tools to make it the best stoner holiday of the year. 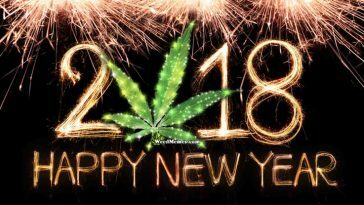 So, sit back, roll one up, and check out our rules to enjoying the perfect New Year’s Weed (Copyright VaultNews 2017)! This should be your mantra for any smoke sesh, but particularly for a special holiday. You may think, “well I can smoke anywhere and have a good time.” True enough, but this isn’t just any day, so you don’t want just anywhere. Choose a place where you can really be yourself. We’re not here to tell you where that is, only that it exists. Don’t settle for going out just because your friends want to. Similarly, many smokers prefer the cozy indoors, letting others display their wild ways. Pick the one that’s best for you. If you choose to leave the safety of your own home, consider smoking beforehand or bringing a personal vape for the occasion. Or, if you’re staying put, don’t forget to load up on the snacks. Food delivery can get mighty busy on the night of nights. Whatever you may choose, remember to be careful and make the most of your night. Herein lies a right of passage for every stoner. Again, this is a consideration that should enter your mind whenever you plan to get high. But, again, this is the time to get it right. Some strains are perfect for a mellow evening, while some will help facilitate the fitful flailings of the fantastic final fling of the year. To lighten the weight of this monumental decision, here are a few strains that might serve you well in your New Year’s endeavors. The ancient Hawaiians had a saying. “The best surfer is the one having the most fun.” Now, yes, we’ll admit that the ancient Hawaiian in question was Tito from Rocket Power, but the point still stands. Blue Hawaiian the strain to choose to help you have a good time. This sativa-dominant strain is packed with energy inducing chemicals that will make you ready for anything. Don’t worry about crashing because this stuff packs a serious punch. We recommend it for going to a club, a crowded bar, or a wild party. Don’t worry about being glued to the couch with one of the toughest strains around. Take a deep breath with this indica packed hybrid strain. So, the night life isn’t for you. Who could blame you? Many, if not most, smokers prefer to just take the edge off rather than the tumultuous life of those crowd-loving ne’er-do-wells at the club. Luckily, Amsterdam Gold is here to see you through the New Year then tuck you in gentler than a newborn. You’ll still get the euphoria and creativity of a good sativa without the all-night rowdiness of a full-blown strain. Instead, enjoy a calm, cerebral high that will allow you to hang out with a few friends, watch some Netflix, and reminisce on the strange, unforgettable year that was 2017. Smoke Amsterdam Gold at about 9 o’clock, and expect to fall asleep around 12:05, having safely rung in the New Year. Who doesn’t feel like they lie somewhere in the middle? Like everyone is choosing sides for you, and you’re stuck trying to maintain your individuality while two ravenous dogs tear at each of your arms? That’s why pot experts combined two strains, Shiskaberry and Frostbite. The result, C4, rests at 50% indica, 50% sativa. What that means for you is a relaxing high that won’t leave you glued to your sofa like a stubborn drop of marinara. You’ll be able to head to the bar, or go to a friend’s house. Maybe you’ll want to spend extra time out, well past 11, or maybe the toll of midnight will send you packing like Cinderella at the the ball. Feel this versatile high with the vigor of someone whose choice hasn’t been made for them. Knowing that your destiny is in the hands of the one person that matters. You! As an added bonus, all three of these strains are available on The Pot Vault. Not only that, but these and many more may be the subject of a 15% New Year’s discount specifically for you! Look, there’s going to be a lot of things to worry about in 2018. Jobs, significant others, places to live; it all can seem like too much to handle. But that’s not what New Year’s Weed is for. Don’t think about all of the worries that will carry into next year, or all of the ones that may develop. Remember the good times that you had in the past year. Think about what you hope to accomplish in the future. There’s a whole year to stress the details, but New Year’s is not the night. Smoke. Have fun. Be merry. If you had a terrible 2017; well, don’t think about that either. Consider the fun you’ll have next year. Its a holiday, and time for you to unwind. The worst thing a stoner can do is get in their head and focus on something that’s been eating at them. Now’s not the time. Leave your fear in last year. However you celebrate, think of the time that you’ve spent in the past year. Remember the good times, but don’t dwell on the bad ones. Many people have had those too, and they’ll pass as they always do. Have fun and remember to stay smokey!